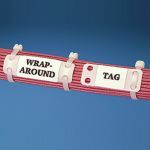 Everything to bundle, route and manage your Wiring Assembly, cable clamps, mounts, retainers, straps, clips and posts. Heat shrinkable flame retardant Polyolefin with adhesive lining. Weather resistant. Pan-Post standoff mounting method #10/M5 screw 1.06inL x .72inW x 1.97inH (26.9mm x 18.3mm x 50.0mm). Used with cable ties MIS. bulk package. Fixed diameter cable clamp #8 screw (M4) .12in (3.2mm) bundle black standard package. Harness replacement elastic band for RER2.0-S6-X. Harness elastic Retainer 2.0in (50.8mm) Bundle #6 Screw (M3). Multiple tie plate 1 bundle M-S ties #10 screw (M5). Epoxy applied cable tie mount natural standard package. Fast-Drop Fiber Radius Control Module. 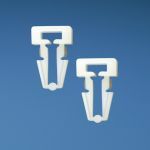 1.0"
4-Way adhesive backed cable tie mount 1in x1in (25.4mm x 25.4mm) white bulk package. Stainless steel tie mount 1 hole mounting. Cable tie moun #8 (M4) screw .63in (16mm) length .43in (10.8mm) width TEFZEL aqua. 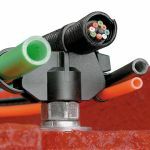 Wire standoff push barb mount .35in (8.9mm) bundle .25in (6.4mm) standoff height natural. Tie harness mount Heat Stabilized 1.54in (39.1 mm) Length black standard package. Multiple tie plate 5 bundle M-S ties #10 screw (M5). Pan-Post standoff mounting method #10/M5 screw 1.06inL x .72inW x 1.97inH (26.9mm x 18.3mm x 50.0mm). Used with cable ties MIS. standard package. Harness clip winged push barb mount horizontal 24 in- .47in (5.9mm - 12.5mm) bundle range black bulk package. Harness clip winged push barb mount horizontal 24 in- .47in (5.9mm - 12.5mm) bundle range black standard package. Adhesive backed cord clip high temp .38in (9.7mm) bundle weather resistant black standard package. Fixed diameter cable clamp #8 screw (M4) .50in (12.7mm) bundle black bulk package. Fixed diameter cable clamp #8 screw (M4) .44in (11.2mm) bundle black bulk package. Fixed diameter cable clamp #8 screw (M4) .31in (7.9mm) bundle black bulk package. Fixed diameter cable clamp #8 screw (M4) .19in (4.8mm) bundle black bulk package. Fixed diameter cable clamp #8 screw (M4) .12in (3.2mm) bundle black bulk package. Bundle retainer 1/4in screw (M6) .2in (50.8mm) bundle .1.59in (40.4mm) standoff height glass filled nylon 6.6 black. 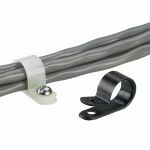 Latching flat cable mount 3.25in (82.6mm) cable width gray standard package. Extra heavy cable tie mount #10 screw (M5) weather resistant Polypropyelene black. 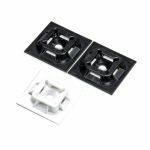 Closed Cable Tie Connector Ring heat stabilized black. Adhesive backed cord clip high temp .19in (4.8mm) bundle weather resistant black standard package. Masonry push barb cable tie mount standard .25in (6.4mm) hole black bulk package. Lightening hole cable tie mount #5 screw natural standard package. 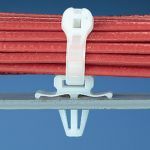 Push barb cable tie mount .25in (6.4mm) hole natural standard package. 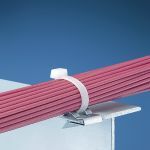 Low profile cable tie mount #5 screw natural bulk package. Cable tie mounts ? user supplied adhesives .62in (15.8mm) natural standard package. Cable tie mounts ? user supplied adhesives .43in (10.9mm) natural standard package. Cable tie mounts ? user supplied adhesives .32in (8.1mm) natural standard package. Winged push barb cable tie mount natural standard package. 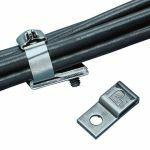 Extra heavy cable tie mount 1/4 screw weather resistant nylon black standard package. Cable tie mount - screw applied .32in (8.1mm)W #6 screw (M3) heat stabilized. Cable tie mount - screw applied .62in (15.8mm)W #8 screw (M4) heat stabilized nylon black. 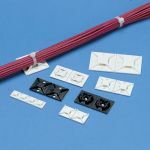 4-Way adhesive backed cable tie mount high temp 1in x1in (25.4mm x 25.4mm) white standard package. Cable tie mount - screw applied #8 Screw (M4) heat stabilized black. 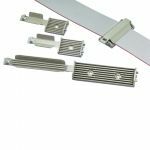 Push button cable tie mount .25in (6.4mm) hole gray standard package. Cable tie mount - screw applied .62in (15.8mm)W #10 screw (M5) nylon standard package. Harness replacement elastic band for RER1.25-S6-X. Cable tie mount - screw applied #8 Screw (M4) black. Lightening hole cable tie mount #6 screw (M3) natural bulk package. 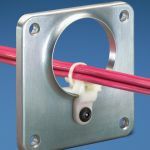 Stainless steel two-way mount one-hole mounting. Use with standard light-heavy and heavy stainless steel ties. 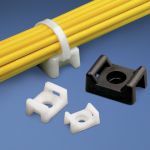 Epoxy applied cable tie mount weather resistant black standard package. Cable tie mount #6 screw (M3) 1in x1in (25.4mm x 25.4mm) white. 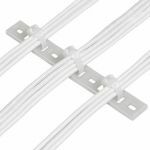 4-Way cable tie mount without adhesive .75in x.75in (19.1mm x 19.1mm) white. 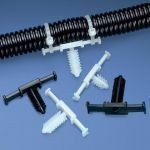 Cable tie mount - screw applied .62in (15.8mm)W #8 screw (M4) weather resistant Polypropylene black standard package. 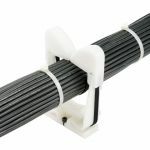 Cable tie mount - screw applied .43in (10.9mm)W #8 screw (M4) weather resistant Polypropylene black standard package. Cable tie mount - rivet applied .43in (10.9mm)W #6 weather resistant nylon black. Harness cable tie mount 1 Tie heat stabilized black standard package. Cable tie mount - screw applied #10 Screw (M5) bulk package. Cable tie mount - rivet applied .43in (10.9mm)W #6 nylon standard package. Cable tie mount - screw applied .62in (15.8mm)W #8 screw (M4) nylon standard package. 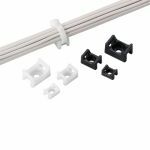 Cable tie mount - screw applied .32in (8.1mm)W #6 screw (M3) nylon bulk package. Fixed diameter cable clamp #8 screw (M4) .50in (12.7mm) bundle white standard package. Cable tie mount - screw applied #8 Screw (M4) bulk package. Adjustable and releasable clamp .69in (17.5mm) bundle standard package. Fixed diameter cable clamp heavy duty #10 screw (M5) .25in (6.4mm) bundle white standard package. 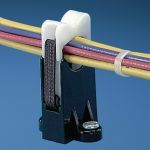 Metal clip-on cable tie mount .46in (11.5mm) height. Low profile cable tie mount #8 screw (M4) natural bulk package. Lightening hole cable tie mount #10 screw (M5) natural bulk package. Bundle retainer #6 screw (M3) .75in (19.1mm) bundle .95in (24.1mm) standoff height impact resistant nylon 6.6 black. 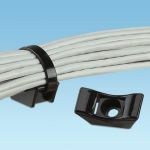 Flat cable clips any width flat cable .56in (14.2mm) width graystandard package. Multiple tie plate 4 bundle M-H ties #10 screw (M5). Low profile cable tie mount #2 screw natural bulk package. Cable tie mount - screw applied .43in (10.9mm)W #6 screw (M3) nylon standard package. 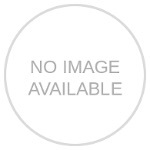 Harness Identification Marker Plate 3.50in x 0.75in(88.9mm x 19.1mm) white bulk package. 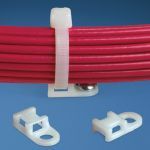 4-Way adhesive backed cable tie mount high temp .50in x.50in (12.7mm x 12.7mm) nylon 6.6 white bulk package. 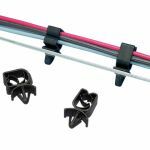 Metal clip-on cable tie mount .55in (14.0mm) height. 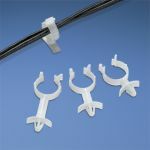 4-Way adhesive backed cable tie mount high temp .50in x.50in (12.7mm x 12.7mm) nylon 6.6 white standard package. Harness spring wire breakout system 6in (152.4mm) hole spacing. Harness spring wire breakout system 12in (304.8mm) hole spacing. Clincher? adjustable releasable clamp #6 Screw (M3) .19in - .69in (4.8mm - 17.5mm) bundle gray standard package. Cable tie mount - screw applied .62in (15.8mm)W #10 screw (M5) weather resistant nylon black standard package. Cable tie mount .31in (7.9mm) stud dia. weather resistant nylon black standard package. Cable tie mount - screw applied #10 Screw (M5) standard package. Adhesive backed cord clip .19in (4.8mm) bundle natural standard package. 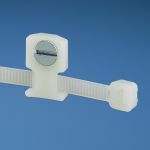 4-Way adhesive backed cable tie mount 1in x1in (25.4mm x 25.4mm) nylon 6.6 white standard package. Right angle cable tie mount #10 Screw (M5). Fixed diameter cable clamp #8 screw (M4) .31in (7.9mm) bundle white standard package. 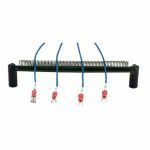 4-Way adhesive backed cable tie mount high temp 1in x1in (25.4mm x 25.4mm) nylon 6.6 weather resistant black standard package. Cable tie mount - screw applied .43in (10.9mm)W #8 screw (M4) nylon bulk package. Snap-in cable tie mount #6 Screw (M3) White. 4-Way adhesive backed cable tie mount high temp 1.12in x1.12in (28.5mm x 28.5mm) nylon 6.6 white bulk package. Cable tie mount - screw applied .62in (15.8mm)W #10 screw (M5) nylon bulk package. Harness board nail standard 3.0in (76.2mm) length.